Welcome October.... and you know what that means. 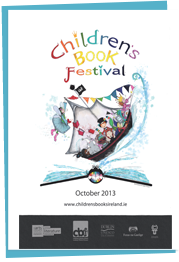 The CBI Children's Book Festival begins today and will be running all month long! With book-related events all over the country, we are celebrating children's books for all ages. Check out you local libraries, bookshops, schools and community centres to find out what they've got going on to add joy and excitement to BookFest this year. Just a few days away from Andrew Lane's visit to us in Dubray Books Galway branch, we're all on a 'Knife Edge' with excitement. I've just come across this article in the Connacht Tribune dated 15 September; 'Young Sherlock falls for Galway's charms in latest adventure' by Jessica Thompson. I'm going to quote directly from the article here; a) so I don't get it wrong and b) because Jessica has it to a tee. "From the moment he steps onto Galway soil at Spanish Arch, Sherlock’s stay in the West of Ireland is filled with gripping adventure and thrilling mystery. Subject to Mycroft’s quizzical mission of contacting the dead, Sherlock ends up in an ancient Irish castle near Salthill, where something very sinister is afoot. Mycroft is in Galway to investigate a psychic who claims he can communicate with dead spies and is offering his services to the highest bidder. But somebody – or something – seems to be trying to silence the psychic. What follows is a mystery that only one as genius as Sherlock Holmes can solve." Knife Edge is indeed a thrilling adventure. Marvellously written, it takes us on a journey right along with Sherlock from the moment he steps off the Gloria Scott at Spanish Arch until the very last page. As with all the series, the reader is given a strong sense and atmosphere of the original Arthur Conan Doyle series. As I have mentioned before (and no doubt will mention again in the upcoming days), Andrew Lane will be at Dubray Books Galway branch on 3rd October. (The classes are coming at 11am and again at 11:45 am) I have two lucky class groups coming in to he him speak about all things Holmesian and young Sherlock's latest adventure. However, I do want to stress, anyone else who wants to drop in is more than welcome!!!! I know it's during school hours, but this is a unique chance to meet Andrew. You won't want to miss it! Oh... by the way... of course we have all the books in the series in stock. "Knife Edge is a thrilling tale of adventure, allowing the reader to picture Lane’s Sherlock Holmes standing by the sea or stepping off a ship at the Spanish Arch. Andrew Lane, an author, journalist and lifelong Sherlock Holmes fan, truly brings the spirit of Sir Arthur Conan Doyle’s character to life, reinventing the world’s most famous and loved detective as a teenage boy." Andrew Lane is Coming October 3rd! Everything is set and I can now reveal that Andrew Lane; author of the rivetting Young Sherlock Holmes series; is coming to Dubray Books in Galway!!!! In celebration of the 6th book in the series, Knife Edge, Andrew will be appearing at 11am at Dubray Books, Shop Street in Galway. While I have school sessions booked for 11am and 11:45 am, all are welcome to come along and meet the author. Andrew will be talking about his books, Sherlock Holmes and you have a truly unique opportunity to hear all about the boy who became the legend. The sixth book is out now, and It takes place in Galway! We are all very excited about this, so don't let the class sessions put you off dropping in. There will plenty of room for everyone! This Friday, September 13th, it's time to celebrate Roald Dahl Day! Roald Dahl Day takes place each year on the 13th of September (Roald Dahl's actual birthday.) And this year, it falls on Friday the 13th, which makes it all the better for a heaping helping of mayhem and mischief. This year, let's celebrate all those amazing, tricksy characters given to us by the world's favourite story-teller. So chose your favourite; who will it be? Matilda and her unique ability to outwit her parents? George and his Marvellous Medicine? What about our old friend, that fantastic Mr. Fox?... so, so many to chose from. 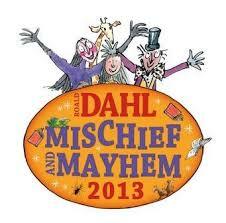 There are endless ways to get involved and have a fantabulous Dahl Day! Get your school classes involved! There may only be a few days... but that's plenty of time for a Dahl party... get dressed up... invite in your local BFG! 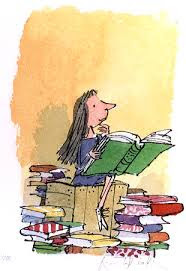 At the very least, why not a Roald Dahl Reading Party with everyone sharing from their favourite book! 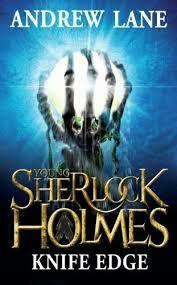 The new book in the Young Sherlock Holmes series by Andrew Lane will be released on September 12th!!!! And, I will shortly have very exciting news for all of us in Galway. All I'm going to say for now is WATCH THIS SPACE! "Something sinister is afoot in the house in the west of Ireland in which Sherlock is staying. There are frightened whisperings among the servants and the house's owners are clearly scared. But who - or what? - has terrified them so much that nobody will speak out? Young Sherlock must bring all his powers of deduction to unravelling his greatest mystery yet. Another fast-paced, brilliantly plotted adventure as teenage Sherlock investigates a new crime and comes up against a fresh crop of sinister, clever criminals." Skulduggery Pleasant! Derek Landy! WOW! And very quickly... as you're out and about, and if you' out and about in Bray and if you are a huge Skulduggery Pleasant fan (who isn't?) Derek Landy will be paying a visit to my work colleagues in Dubray Books Bray shop for a signing! 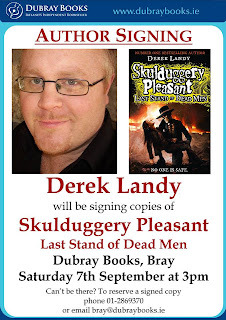 Yes, Derek will be signing copies of Last Stand of Dead Men at Dubray Books, Bray this Saturday, September 7th at 3pm. You may have to stand in queue for a while, but trust me.... this is totally worth it. Derek is one of the nicest, funniest, most entertaining people you will ever meet...and the books are GREAT! The 2013 Mountains to Sea Festival is well under way! (Sorry about that... 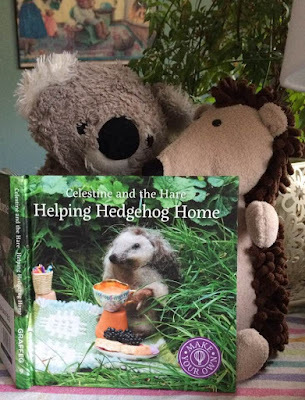 I've had some difficult personal matters tat have kept me away from the blog for far too long...) But there is still time to get in on some fantastic family/kids events! If you check the programme (link below) you'll see what I mean. But let me highlight one or two events for you; get there if you can! You won't regret it! Is there more? Well, of course there is! Just go to the link below and you're bound to find exactly the perfect way to spend your weekend! I am sorry to say I won't be joining you... I'll be at work alerting all and sundry to great children's books!